Great old lens with nice looking design. Built from aluminium and fine quality glasses so not heavy at all it has comparable weight than modern all over plastic lenses. 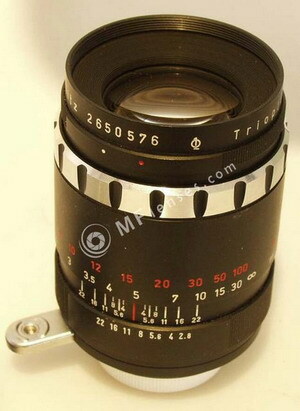 I found this lens more rare than other alu Trioplan 100mm f/2.8 and very limited information resource available on Internet.So I can't provide you more information, I will measure missing data later when I reorganize my dry box with lenses.Shortly in my opinion from this lens, sharpness just excellent especially for a portrait focal length. Color rendering also quiet good, not my favorite but not bad at all.This lens one of the hidden daimond as many others from Meyer-Optik Görlitz.Usually you can get this lens for bargain, don't hesitate grab it. It is a really great thing and I think it should be in line of "must have"
Indeed, if you make a review I will publish it and link to your source, I have this lens long time ago I found excellent. I have this lens which is obviously related, but to the one shown here but it is not like others that I currently see for sale. I thin this is an earlier model S/N 5553972. It is a "Zebra" with the aperture ring at the front of the lens on "the zebra". In any case it is a delightful little lens and I love it to bits already.